The Telescopic Chute is a very effective dust control equipment, primarily used for loading of bulk material into open trucks, bulkers and containers. It is also referred to as telescopic loading spout or simply loading spout. An important application of the equipment is in port mechanization i.e loading of barges and ships. It comprises of inner sections which can be either conical or cylindrical, which contains the bulk material flow. 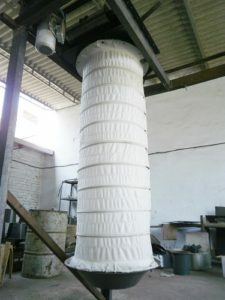 An outer bellow which is flexible is used to limit the propagation of dust. In case of mechanized warehouses, telescopic loading spout is used for maintaining dust free environment by containing the dust discharged from height. The equipment helps in maintaining clean and healthy environment form employees. AEGIS manufactures both the type of standard models of Telescopic Chute as well as customized one as per the need of the client and the application. It comes with cones or cylinders with different material of construction like MS, Sail hard, etc. depending on the need. AEGIS designs, manufactures and supplies Loading Spout with either motorized (winching) arrangement or even pneumatic arrangement wherever space is a constraint. To further improve the dust control feature, AEGIS also manufactures Telescopic Chute with integral bag filters (Pulse Jet Type). Loading Spouts manufactured by AEGIS have been rigorously tested and supplied to various prestigious clients all over India.